With the whole world drooling over full frame, mirrorless cameras I just had to pick this moment to buy a Panasonic G9. What was I thinking? Okay, let's set the stage for all the people who will read the blog for the first time and start screaming, "fanboy. I bet he's never even tried out a full frame brand X!!!!!" I have one job and it's to create visual content for commercial clients. To that end I have two full frame, Nikon D800x cameras, a couple of older full frame D700 cameras, and, at one time or another I've owned or borrowed and shot with just about every full frame digital camera on the market, including Canon 1 series cameras and 5 series cameras, including both Sony's mirrorless A7xx series cameras, and SLT a99, as well as Sony's more conventional a850 and a900 cameras. In fact, the only camera maker whose full frame (meaning: just about equal in size and shape to 35mm film) camera I haven't played with is the Pentax. I've also shot with the medium format digital cameras from three different companies. But, in the end, the cameras I have the most fun and, sometimes, the most success with seem to be the one's from the two micro four thirds vendors; Olympus and Panasonic. And lately Panasonic seems to be bringing to market more and more of the cameras that seem just right for me. After shooting nearly 5,000 frames in the service of three different clients, last week, I looked back on what worked and then what worked better and after a dispassionate review; and after having looked at nearly all 5,000 of the images, I drove up to Precision Camera at rush hour, on the jam-packed Mopac Expressway (cruelly mis-classified as there is nothing remotely "express" about it) walked inside and asked one of my favorite sales associates to grab me a brand new Panasonic G9 and take my money. But why? There's not one particular thing that moved me to make the purchase, instead there were dozens of small things that I think about as I'm shooting that cause me to either appreciate or regret having brought along a particular camera (or lens). In the case of the Panasonic top tier of camera models it's all about a combination of features and performance. I thought it would be tough to beat the video imaging performance of the GH5 until I bought and started using the GH5S. The camera is dismissed all the time for being "only ten megapixels" and for having no built in image stabilization. But if the people who dismiss the camera for not having their favorite features would actually test the camera and shoot the camera I think most would be amazed at just how beautiful and different the GH5S files can look. I had to make some decisions last week about which camera system to bring to a three day corporate event that required me to be fast, mobile, discreet and efficient. I needed to be able to shoot a lot of stuff, make it look good for multiple uses and also make files that were efficient (small) enough to be easily upload able --- in bulk. Part of the job was to provide instant access to the files for the client via a shared web folder. This kind of job is no place for finnicky, fussy practitioners who can only pull off a decent photograph if they shoot it at 45 megapixels in raw and then spend half a day massaging it and working with the file in PhotoShop. I needed to be able to send Jpegs that came straight out of the camera and I like the challenge of doing that. I was torn between using the Nikon D700s because they are "full frame" and the files are the right size. But man, are they ever loud. Then I considered the D800e and D800 but it's the same thing. The advantage of those cameras is in the raw file potential, once you start working in a file size that makes sense for the kind of project I was doing it doesn't make much sense to drag a big camera and big lenses around --- and I couldn't figure out how to make the cameras quiet enough and discreet enough to make them comfortable working tools for a highly focused conference. I ended up shooting the show with the GH5 and GH5S cameras, both set to 10 megapixels, because they checked all the right boxes. They are small, quiet (even when using mechanical shutters they are 1/3 as loud as the D800s) an easy to carry around all day long. The capper was that my client wanted some short video of each speaker doing their presentations up on the stage and I couldn't think of a better camera and lens combination for that than the GH5S and the Olympus 12-100mm f 4.0 Pro lens. You might be able to pull something video-like off with the Nikons but I guarantee you'll be working a lot harder for your money. By the third day I knew I'd made the right choice and chance hammered the point home for me at the start of the main tent session that Friday. I'd gotten to the venue ( a very nice hotel in downtown) early in the morning, had a nice coffee on a terrace overlooking the city, and I got to savor a sunrise and the first cool air of Fall. Just before the start of the morning's program the first speaker came into the main ballroom followed by a woman with a big camera bag, a light stand and several big Nikon DSLRs around here neck. She started to set up a light but the head event planner for the company holding the conference quickly let the newly arrived photographer know that flash during the presentations was NOT allowed. The woman looked around and identified me as the show photographer and came over to explain to me why she was there. She'd been hired by the speaker to get some "action" shots of him speaking. I smiled and welcomed her to the venue. Then I made a bee line to my contact to let her know that if she heard loud shutter noise during the presentation that it was NOT from me. My cameras are quiet but also have a fully silent mode that I use when I think silence is called for. The show kicked off, the speaker bounded up on stage (and he was very good!) and then all hell broke loose with the clacking of a mirror and shutter. It was amazing, I'd been photographing the previous two days from near the back of the room and most people in the audience had no idea I was in the room. Once the speaker's photographer let loose with the Nikons half the room turned around to look. She soldiered on and the audience eventually lost interest but the message was not lost on me = there is a better way. But I didn't make up my mind to buy another camera until later. On Sunday evening, freshly back from my visit to my father, in San Antonio, I sat in front of my big screen and started evaluating files from a range of assignments I'd done over the past six days. There were studio portraits of several doctors that I'd shot with controlled lighting and the full 14 bit raw files of the Nikon D800e. There were 500+ shots I'd done for a Zach Theatre rehearsal I'd made shooting raw files with the Nikon D700 and there were several thousand shots and a bunch of video I'd done with the GH5 (vanilla version). All were good but I've got to burst some bubbles here; there aren't huge and glaring differences in quality between the formats or the cameras. In some instances I see the color from the D700 as superior to the D800e and I don't really see a lot of difference in noise profiles between all of the different cameras I shot. But then I started looking at some still photographs I'd shot with the GH5S. The images from the GH5S are really nice. Even though I was photographing with Jpeg settings the files were rich and the color was superb. But the biggest thing for me was how nice the basic contrast of the files was and how much detail they showed without being oversharpened. I'd go so far as to say that the files from the GH5S are some of the nicest I've ever seen coming out of a modern, digital camera. I had the idea that a fair amount of what I'm seeing comes from new color science in the most recent Panasonics which is likely a result of a generation of faster processors that are capable of doing a much more nuanced job of file construction during shooting. What I've read in reviews led me to believe that this same color science I was seeing in the GH5S is embedded in the G9 as well. If I was an amateur and I was photographing only for my own pleasure I am almost certain I'd be happy with the GH5S, but as I said in the first paragraph, I do this photography thing for a living. While a hobbyist will be fine with one great camera my event job this week was a perfect example of a situation in which two (identical) camera is better, more efficient and more effective. When shooting a speaker on a stage, or a group of people at a happy hour, or any other event in which you constantly need to shift from wide, establishing shots to medium shots and also to tight shots that are almost headshots, all from one position, you learn that you need at least two zoom lenses on two cameras. You don't want to take time to change lenses on a single body, you want to be able to pull one camera up to your eye and shoot with the long lens and then, when you know you have that shot, you let that camera and lens combination hang over your shoulder on its strap while you bring your camera with the short lens up to your eye and shoot, with no delay. It's a much more fluid way of shooting than digging into your bag to grab a different lens and then trying to get the lens mount squared up in the dark. After seeing the color and tonality (and the perception of sharpness) from the GH5S I knew I wanted that but in a camera that matches the GH5 more closely. 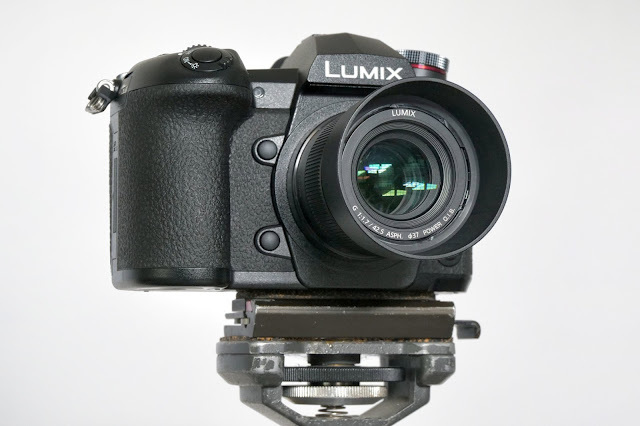 I want to use in body image stabilization when I need to and while the I.S. in the Olympus lens works well with the "S" body the image stabilization in the G9 lets me use any lens and still get the benefits of I.S. 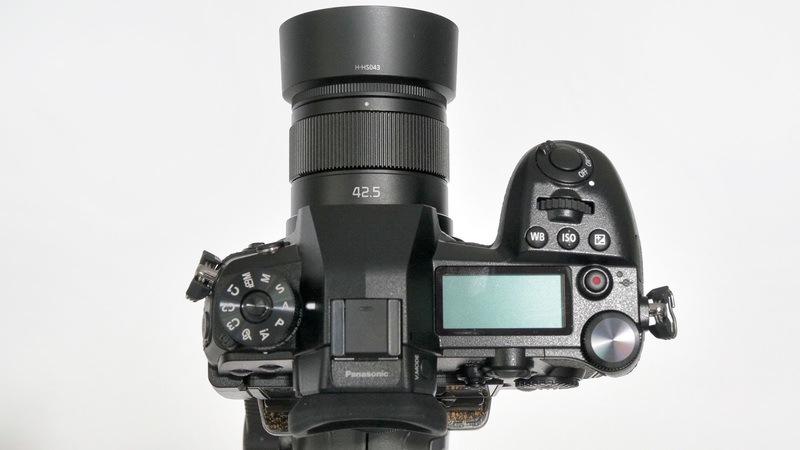 I also wanted a second still camera that matches the GH5's high resolution of 20 megapixels; not because I need it all the time but because there are projects and genres of photography that do benefit from having the right number of pixels. Since all three of the camera bodies take the same batteries I can take all the cameras on location and intermix batteries at will. I'm just now testing out the G9 but it's so familiar, having spent a year with two GH5's and their very rational menu structure. There's not a big learning curve. I'm shooting a quick job with the G9 on Thursday this week and again two days next week, and if it makes photographs that are as beautiful as those from the GH5S then the G9 will be the primary camera I take with me to Iceland on the 27th of October. With the GH5 coming along as a great back up. There are many things I like about the G9. At least in theory. I like the bigger EVF. I like the idea of the high resolution mode. I like the huge USB 3 port on the camera almost as much as I appreciate the full sized HDMI port. For the faint of heart the G9 comes with two card slots and both of them are fast UHS II slots. While QXD cards may be faster SD V90 cards that can handle up to 400 Mbs are no slouches. The bottom line in my decision to flesh out the M4:3 cameras is the desire to balance ease of use, tight and useful imaging feedback via the finder, very good raw files, just the right file size for most stuff and when needed the ability to make video that is so good it will make a cinematographer smile with surprise. Does this mean I'm rushing to sell off the Nikons I've been lauding for the last six months? Gosh no. They still have their place in the inventory. The D800s do wonderful work in the studio, and for those odd times when noise doesn't matter. And those D700s are too endearing to get rid of. Not to mention that they are so cheap I wouldn't get much on a trade or straight out sales and I like to use them because for some reason I can't really explain they seem to bring out the best in 50mm and 85mm lenses. That's reason enough to use them. I decided to buy the G9 at this juncture because they are currently on sale everywhere in the USA for around $1,500. It's a $200 savings from their recent retail price. You can argue that you can get a full frame Canon 6D2 or a recent Sony A7ii for that price or less but you'd miss the point that, to me, the full frame sensor is not that big a deal. It's more like the idea of having a car with a big, big eight cylinder engine. Your opportunities to see any performance differences between that and a more efficient car with a smaller motor shrink daily. As we all move from print and from making prints we see the space in which cameras really have room to show off their potential (the potential you pay for) is extremely limited by your final uses. All the potential in the world is meaningless if you don't have a consistent venue in which to show it off. There are few (very few) times when there is so little traffic on Austin streets that you would be able to drive over 60 mph without immediately rear-ending the car in front of you. By the same token, with most of our work heading to the web, and being showcased on screens, the potential of larger format camera (if the glass on all contestants is equally good) is wasted. Part of the reason I switched in and out of the earlier m4:3 systems was down to my own bad lens buying strategy. I scrimped on lenses and blamed the cameras. People do this all the time. The two lenses that have effectively cured me of this are the 12-100 and the 40-150 Olympus lenses for the systems. They cut down the overall difference in quality between the smaller format and full frame by a huge amount and more or less evened the playing field; at least where optimum ISO settings are concerned. I'm not saying you need to choose one format over the other. I think, if you are a commercial photographer with wide ranging interests or a large number of sub-disciplines you should have multiple cameras and lenses at your disposal because all formats (and brands) have their strengths and weaknesses. Panasonics just seem to have fewer of the weaknesses right now. Next time around let's talk about why I prefer the Olympus lenses. That's another piece of the puzzle. In the meantime be sure to go out and buy several different camera systems so we can all discuss the differences between them with the (radical) benefit of experience and hands-on working comparisons. Shoot 5,000+ good frames in a week. You might just amaze yourself.